Background: Although high levels of subjective well-being (SWB) are common in old age, a subset of older individuals is disproportionately vulnerable to negative affect. Yoga has been shown to have many short-term benefits, but researchers have not determined whether a long-term or frequent yoga practice increasingly protects older women from low levels of psychological well-being. Aims: The purpose of this study was to examine the extent to which psychological attitudes, transcendence, mental mastery, and subjective vitality in a sample of female yoga practitioners over 45 years varied according to the length and frequency of yoga practice. Materials and Methods: We administered online surveys to a non-probability sample of 211 female yoga practitioners 45 to 80. We used weighted least squares regression analyses to evaluate the relationship of extent of yoga experience to the outcome variables after accounting for age and lifestyle factors. Results: Participants had practiced yoga for as long as 50 years and for up to 28 h per week. There were significant positive relationships between yoga experience and all outcome variables. These significant relationships remained after accounting for age and lifestyle factors. When we computed yoga experience in terms of total calendar years, without accounting for hours of practice, significant relationships did not remain. 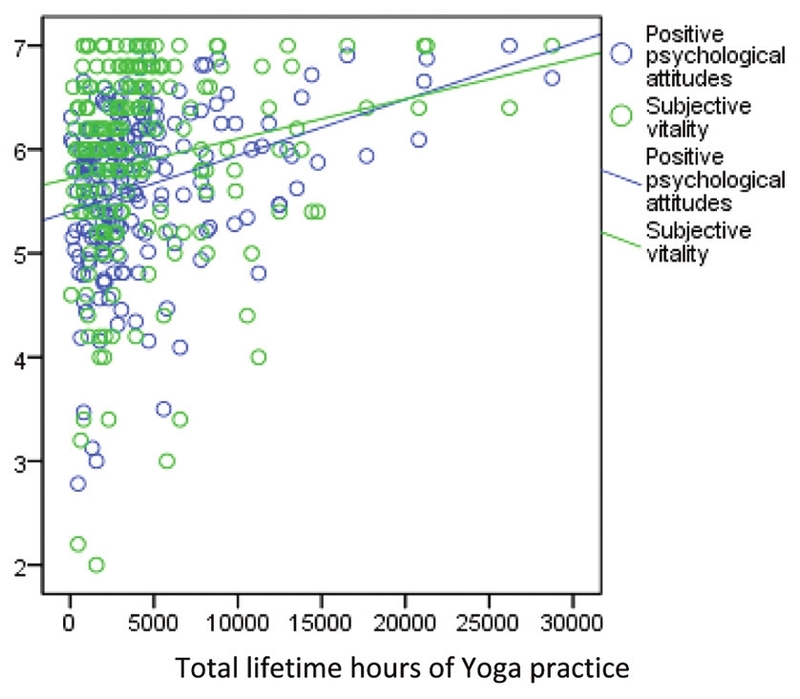 Transcendence of the ordinary was the most strongly associated with current yoga practice frequency, and positive psychological attitudes were the most strongly associated with total lifetime hours of practice. Conclusions: Among a non-probability sample of female yoga practitioners between 45 and 80 years, increased yoga experience predicted increased levels of psychological well-being. Results showed a dose-response effect, with yoga experience exercising an increasingly protective effect against low levels of SWB and vitality. Keywords: Aging; vitality; well-being; women; yoga. Wellness practices are believed to trigger self-healing mechanisms and intrinsic adaptogenic responses. According to the theory of salutogenesis, the regular engagement in wellness practices, or salutary behaviors, creates steady improvements in physical and psychological health. , From the perspective of this theory, there is not an upper limit to the level of health that an individual can attain. In this observational, cross-sectional study, we tested the hypothesis that an increasing level of Hatha yoga practice was associated with higher levels of positive psychological attitudes, mental mastery, subjective vitality, and transcendence of the ordinary in women over 45 years. We located participants through postings to senior lists, health clubs, religious organizations, social action networks, online university lists, and charitable organizations. In addition, we asked yoga teachers to distribute flyers and notifications to yoga students, and we invited members of online yoga lists to participate. We defined yoga practitioners as individuals who reported nonzero hours per week of current yoga practice and nonzero prior history of yoga practice. We defined yoga to include asana (postures), practiced along with controlled breathing and meditation. Further details for the recruitment of the sample of 211 yoga practitioners, along with data collection methods, have been reported in a previous publication. The Institutional Review Board of Northcentral University granted permission in October 2009 to conduct the study. Data were collected in October and November 2009. Participants indicated informed consent by a selection on the first screen of the survey. All measures were self-reported. Participants provided data for age, educational level, marital status, height, weight, levels of processed food consumption, hours of non-yogic exercise per week, and hours of seated meditation per week. Participants reported the level of processed food consumption on a Likert-type scale in response to the question, "I eat a lot of refined sugar, refined flour, and processed food." Values ranged from 1 (very true) to 7 (not at all true), with higher scores representing lower levels of processed food consumption. Further definitions and data collection methods of covariates were reported in a previous publication. The outcome variables were positive psychological attitudes, mental mastery, transcendence, and subjective vitality. The Subjective Well-Being Inventory, published by the World Health Organization, was developed in India and has been tested in several different population groups and languages. The instrument was developed in response to a dearth of measures for positive mental health, in contrast to the many studies available on disease, disability, and disorders. The scale consisted of semantic differential items with values ranging from 1 to 3. We selected the three-item Transcendence subscale (SUBI-T) and the five-item Inadequate Mental Mastery subscale (SUBI-MM) for use in this study. As increased transcendence was represented with lower scores, we reverse-coded the values for transcendence. Increased levels of inadequate mental mastery were represented with lower scores. Therefore, higher scores on the SUBI-MM indicated higher levels of mental mastery, and we did not reverse-code the scale. The Subjective Well-Being Inventory was developed and validated primarily by a systematic qualitative process known as the stepwise ethnographic method. Researchers began with unstructured interviews with participants, conducted meetings with interviewers and experts, and proceeded iteratively to clarify concepts. Final qualitative validation was achieved by means of focus group discussions with participants. Factor analyses were then used to verify the subscales, and normal distribution was confirmed. Although the entire instrument was in the public domain, permission was granted for the use of the selected subscales and for online data collection. Questions for the SUBI-T addressed feelings of ecstasy, bliss, and unity with the cosmos. The SUBI-MM included questions such as, "Do you sometimes feel sad without reason?" and "Do you feel disturbed by feelings of anxiety and tension?" The Subjective Vitality Scale  originally contained seven items, but the more recent version of six items was found to be more internally reliable and to load on only one factor. The instrument included questions such as, "I have energy and spirit" and "I feel alive and vital." Items were represented on a Likert-type scale with values ranging from 1 (not at all true) to 7 (very true). Correlations with moods, as assessed by the Profile of Mood States, were non-significant except for scales of fatigue, depression, and particularly vigor. The author of the Subjective Vitality Scale granted permission to use the scale. The instrument was designed for electronic collection of data. We computed bivariate correlations to determine the relationship between yoga experience and all outcome variables. We then performed weighted least-squares (WLS) regression analyses to determine the contribution of yoga practice to outcome variables after correcting for covariates. The covariates evaluated included age, marital status, educational level, BMI, hours of non-yogic exercise per week, level of processed food consumption, and hours of seated meditation per week. For the purposes of these analyses, we deconstructed yoga experience to represent experience in the practice of asana (yoga postures) practiced with breathing and conscious awareness, and we reported hours per week of seated meditation as a separate variable. However, in the interpretation of the results, we recognized asana and seated meditation as part of a unified system of yoga practice. We initially entered all covariates into each model. We then removed non-significant covariates and entered a reduced model, including only the covariates that were significant in the previous model. We continued this process iteratively until all covariates showed significant results. Both standardized and non-standardized coefficients are reported, together with significance levels for each covariate in the model. [Table 1] shows the frequency distributions of all outcome variables. All mean scores exceeded the scale midpoint. As outcome measures showed a normal distribution of residuals, we used parametric statistics to conduct the analyses. Measures of Hatha yoga experience (current hours per week, total lifetime hours, and total calendar years) were significantly intercorrelated [Table 2]. Psychological measures (positive psychological attitudes, transcendence, mental mastery, and subjective vitality) were also significantly intercorrelated, P < 0.001 [Table 3]. Current hours per week of Hatha yoga experience and total lifetime hours of yoga practice were positively correlated with all outcome variables [Table 4]. Total calendar years of Hatha yoga experience were positively correlated with positive psychological attitudes, r (207) = .19, P = .007; and with transcendence, r (209) = .18, P = 0.01. The bivariate relationships of total calendar years with mental mastery and subjective vitality were not significant. The variances of the scores were not distributed equally. High levels of yoga experience predicted high outcome scores, but low levels of yoga experience did not predict low outcome scores [Figure 1]. Therefore, WLS regressions were used to perform the regression analyses. We evaluated the extent of yoga experience as a predictor of the level of positive psychological attitudes over and above significant covariates. Age, marital status, BMI, and hours of non-yogic exercise per week did not contribute significantly to positive psychological attitudes for any regression model. Therefore, we used a reduced model, including only educational level, level of refined and processed food consumption, and hours of seated meditation per week as covariates. Educational level predicted a significant outcome only when current hours per week were used as a predictor, P = 0.045. The relationship was inverse. Both current hours per week and total lifetime hours accounted for a significant proportion of the variance in the level of positive psychological attitudes, P < 0.001, over and above the contribution of covariates [Table 5]. The contribution of total calendar years was not significant. We evaluated the extent of yoga experience as a predictor of the level of transcendence of the ordinary over and above significant covariates. Hours of seated meditation per week were the only covariate to contribute significantly to the outcome for any regression model. The contribution of current hours per week to the outcome was significant, P < 0.001. The contribution of total lifetime hours to the outcome was significant, P = 0.001 [Table 6]. The contribution of total calendar years to the outcome was not significant. We evaluated the extent of yoga experience as a predictor of the level of mental mastery over and above significant covariates. Education, marital status, BMI, and hours of non-yogic exercise per week did not contribute significantly to mental mastery for any regression model. Therefore, we used a reduced model, including age, level of refined and processed food consumption, and hours of seated meditation per week as covariates. The contribution of Hatha yoga experience to the outcome was not significant for any regression model. However, the contribution of hours of seated meditation per week was significant for current hours per week, P = 0.01; for total lifetime hours, P = 0.01; and for total calendar years, P = 0.004 [Table 7]. The strongest predictor for all models was the level of refined and processed food consumption, P < 0.001, with lower levels of processed food consumption predicting higher levels of mental mastery. We evaluated the extent of yoga experience as a predictor of the level of subjective vitality over and above significant covariates. Age, education, marital status, BMI, and hours of seated meditation per week did not contribute significantly to subjective vitality for any regression model. We, therefore, used a reduced model, including only average hours of non-yogic exercise per week and level of refined and processed food consumption as covariates. The contribution to the outcome was significant for current hours per week, P = 0.01; and total lifetime hours, P = 0.03 [Table 8]. The contribution of total calendar years was not significant. We used four outcome measures in this study to evaluate whether a longer-term and more frequent yoga practice was associated with higher levels of psychological wellness in a group of women aged 45 to 80 years. Three of these outcome measures - positive attitudes,  transcendence,  and subjective vitality  - were designed to measure long-term, stable, and enduring wellness. The Inadequate Mental Mastery subscale  was designed to measure sadness, irritability, anxiety, and other indicators of negative affect. Higher levels of negative affect were represented with lower scores on the Inadequate Mental Mastery subscale. Therefore, for this discussion, higher scores on the scale are assumed to indicate more positive moods. Increasing levels of yoga practice were associated with higher levels of psychological wellness and subjective vitality in this study, regardless of age. Age contributed to mental mastery scores, but not to any other measure, when total calendar years of yoga practice were used as the main predictor. A higher age predicted improved moods. After correcting for covariates, total calendar years of yoga practice (without accounting for practice frequency) were not significantly related to any outcome variable. All significant findings were related to a measure of hours of practice, including hours per week and total lifetime hours. Although marital status has been found throughout the literature to predict increased SWB,  no relationship between marital status and SWB was found in this study. Body mass index was also unrelated to any outcome measures. Levels of processed food consumption contributed significantly to the outcomes for positive attitudes, mental mastery, and subjective vitality, with lower levels of processed food consumption predicting higher levels of wellness. Refined and processed food consumption was the most significant predictor in the mental mastery model, P < 0.001, for all measures of yoga experience. All multiple regression analyses in this study required the use of WLS regression, because variances were unequal for each bivariate correlation evaluated. Scores of individuals with little yoga experience ranged in outcome from the lowest to the highest levels of wellness measured, including scores equal to the highest scores measured for yoga practitioners. However, as the Hatha yoga experience (measured both as current hours per week and as total lifetime hours) increased, minimum outcome scores steadily increased. The result was the right-triangular pattern typified in [Figure 1]. Findings were consistent with an interpretation that an increased yoga practice exercises an increasingly protective effect against low levels of wellness in women over 45 years. Practicing yoga for many years, but not often, generally did not offer these apparent protections. Hours of seated meditation per week, a component of a yoga practice, contributed significantly to the outcome for positive attitudes, mental mastery, and transcendence of the ordinary. The contribution of Hatha yoga practice to mental mastery, the only measure of negative affect in the study, was not significant after correcting for hours of seated meditation per week. This finding departed from findings in the literature according to which levels of depression and anxiety declined significantly after brief Hatha yoga interventions. Although several of these studies ,,, involved integrated interventions including asana, breathing exercises and seated meditation, other studies of depression and anxiety involved primarily Hatha yoga interventions. Cohen  examined Hatha yoga intervention and seated meditation separately, and found that in the first 8-week session, Hatha yoga had a stronger effect on improving mood than did the seated meditation. Three interventions ,, were based on Iyengar yoga, a method that focuses on carefully executed physical postures and typically does not involve separate breathing and meditation exercises. In all cases, participants showed significant improvements in depression and anxiety levels after Hatha yoga practice. Further research is needed to confirm or disconfirm the finding of this study that yoga asana (practiced with conscious breathing and awareness) did not predict improved moods after correcting for food patterns and seated meditation practice. Findings of this study were generally consistent with prior research findings showing improved well-being after brief yoga interventions. ,,,,,,,,,, However, this study is the first to demonstrate a dose-response relationship between extent of yoga experience and measures of psychological wellness. For current hours of yoga practice per week, the strongest effect was shown for transcendence of the ordinary, a measure indicating feelings of unity with the surrounding world, intense happiness, joy, ecstasy, or bliss. For total lifetime hours of yoga practice, the strongest effect was shown for positive psychological attitudes. Although yoga experience (including both Hatha yoga and seated meditation) predicted all measures of wellness used, the weakest effect was shown for the single measure of negative affect used in this study. All outcome measures were strongly correlated, P < = 0.001, but distinct. We assumed that participants had a working knowledge of English sufficient to understand and respond to questions. We assumed that responses to self-report questions were truthful and accurate. The study was limited by a non-probability sample selection, with uneven representation in terms of ethnicity and geographic location. Individuals more subjectively committed to a yoga practice may have been more inclined to participate in the study. Recruitment of some participants from yoga lists and through yoga networks may have also created bias in the sample selection. The study was limited by the lack of a control group. The lack of a question on income or socioeconomic status was also a limitation. In terms of directions for future research, longitudinal studies are needed to track beginning yoga students over 2 to 5 decades. As income and socioeconomic status have been found to be a strong predictor of SWB,  we recommend including income as a covariate in future studies. We also suggest further investigations into other wellness practices, such as Tai Ch'i, seated meditation without asana, and whole-foods diets, to determine whether the statistical patterns found are similar to the heteroskedastic patterns found in this study. Although findings from many brief interventions have shown that Hatha yoga is of benefit to beginners for depression and anxiety, further research is needed to deconstruct the effects of Hatha yoga and seated meditation in evaluating effects on anxiety, depression, sadness, and irritability among long-term yoga practitioners. In this non-probability sample of 211 women aged 45 to 80 years, we found a dose-response effect, with higher levels of yoga experience predicting increasingly high levels of psychological well-being on all outcomes measured. When yoga experience was measured as total calendar years, without considering the hours of yoga practice, we generally did not find a dose-response effect. A frequent yoga practice was the most consistent predictor of psychological wellness tested in this study. The regularity and frequency of the practice appears to be an essential component of the relationships discovered. Hours of seated meditation per week and avoidance of processed and refined food were also strong predictors. Age was a predictor in only one of the 12 analyses conducted. In that instance, increased age predicted decreased levels of sadness, depression, anxiety and irritability. This finding was consistent with the preponderance of the literature showing overall increases in positive affect among older individuals. High levels of SWB were found among participants in this study regardless of the extent of yoga experience. However, Stanley and Isaacowitz  found that although older adults constituted a higher proportion of individuals with the most positive affect, they also constituted a higher proportion of individuals with the most negative affect. In contrast, low levels of SWB steadily disappeared from the scores on all measures used for this study as the extent of yoga experience increased. The results suggest that yoga, when practiced regularly and with commitment, may exercise a protective effect against low levels of SWB and subjective vitality among older adults. Health is the strongest predictor of SWB among the elderly. The frequent and long-term practice of Hatha yoga has been shown to predict increased physical wellness among older women. These increases in physical wellness may be a component of the protective effects for SWB found in this study. 1. Jonas WB, Beckner W, Coulter I. Proposal for an integrated evaluation model for the study of whole systems health care in cancer. Integr Cancer Ther 2006;5:315-9. 2. Antonovsky A. The salutogenic model as a theory to guide health promotion. Health Promot Int 1996;11:11-8. 3. Duckworth AL, Steen TA, Seligman MEP. Positive psychology in clinical practice. Annu Rev Clin Psychol 2005;1:629-51. 4. Frankl VE. Man's search for meaning. New York: Washington Square Press; 1995. 5. Rogers C. On becoming a person: A therapist's view of psychotherapy. New York: Houghton Mifflin; 1961/1995. 6. Maslow A. Toward a psychology of being. Princeton (NJ): D. Van Nostrand Company, Inc; 1962. 7. Peterson C. A primer in positive psychology. New York: Oxford University Press; 2006. 8. Jung CG. The undiscovered self. New York: New American Library; 1957/2006. 9. Becker CM, Moore JB, Whetstone L, Glascoff M, Chaney E, Felts M, et al. Validity evidence for the Salutogenic Wellness Promotion Scale (SWPS). Am J Health Behav 2009;33:455-65. 10. Ryff CD, Singer BH. Know thyself and become what you are: A eudaemonic approach to psychological well-being. J Happiness Stud 2008;9:13-39. 11. Gable SL, Haidt J. What (and why) is positive psychology? Rev Gen Psychol 2005;9:103-10. 12. Seligman M, Csikszentmihalyi M. Positive psychology: An introduction. Am Psychol 2000;55:5-14. 13. Peterson C, Park N, Seligman ME. Orientations to happiness and life satisfaction: The full life versus the empty life. J Happiness Stud 2005;6:25-41. 14. Bijlani RL, Vempati RP, Yadav RK, Ray RB, Gupta RB, Sharma R, et al. A brief but comprehensive lifestyle education program based on yoga reduces risk factors for cardiovascular disease and diabetes mellitus. J Altern Complement Med 2005;11:267-74. 15. Iyengar BK. Light on Life: The Yoga Journey to Wholeness, Inner Peace, and Ultimate Freedom. US: Holtzbrinck Publishers; 2005. 16. Khalsa SB. Yoga as a therapeutic intervention: A bibliometric analysis of published research studies. Indian J Physiol Pharmacol 2004;48:269-84. 17. Lipton L. Using yoga to treat disease: An evidence-based review. JAAPA 2008;21:34-6, 38, 41. 18. Kirkwood G, Rampes H, Tuffrey V, Richardson J, Pilkington K. Yoga for anxiety: A systematic review of the research evidence. Br J Sports Med 2005;39:884-91. 19. Pilkington K, Kirkwood G, Rampes H, Richardson J. Yoga for depression: The research evidence. J Affect Disord 2005;89:13-24. 20. Chong CS, Tsunaka M, Tsang HW, Chan EP, Cheung WM. Effects of yoga on stress management in healthy adults: A systematic review. Altern Ther Health Med 2011;17:32-8. 21. Cohen DR. A comparative study of Hatha yoga and seated meditation on mood elevation. Unpublished master's thesis. Philadelphia, PA: University of Pennsylvania; 2007. 22. Danhauer SC, Mihalko SL, Russell GB, Campbell CR, Felder L, Daley K, et al. Restorative yoga for women with breast cancer: Findings from a randomized pilot study. Psychooncology 2009;18:360-8. 23. Khemka SS, Ramarao NH, Hankey A. Effect of integral yoga on psychological and health variables and their correlations. Int J Yoga 2011;4:93-9. 24. Khalsa SB. Research update: Mental health. Presented at Symposium on Yoga Therapy and Research. Los Angeles, CA: International Association of Yoga Therapists, 2009. 25. Eggleston B, Middlestadt SE, Lindeman A, McCormick B, Koceja D. Yoga's therapeutic value: Perceptions of yoga as serious leisure and the flow experience. International Journal of Yoga Therapy 2009;Supplement:43. 26. Sharma R, Gupta N, Bijlani RL. Effect of yoga based lifestyle intervention on subjective well-being. Indian J Physiol Pharmacol 2008;52:123-31. 27. Sell H, Nagpal R. Assessment of subjective well-being: The Subjective Well-Being Inventory (SUBI). Regional Health Paper, SEARO, No. 24. New Delhi: World Health Organization, Regional Office for South-East Asia; 1992. 28. Ryff CD, Singer BH, Love GD. Positive health: Connecting well-being with biology. Philos Trans R Soc Lond B Biol Sci 2004;359:1383-94. 29. Bell IR, Koithan M. Models for the study of whole systems. Integr Cancer Ther 2006;5:293-307. 30. Quinn JF, Smith M, Ritenbaugh C, Swanson K, Watson MJ. Research guidelines for assessing the impact of the healing relationship in clinical nursing. Altern Ther Health Med 2003;Supplement 9:A65-79. 31. Moliver N, Mika EM, Chartrand MS, Burrus SW, Haussmann RE, Khalsa SB. Increased Hatha yoga experience predicts lower body mass index and reduced medication use in women over 45 years. Int J Yoga 2011;4:77-86. 32. McGonigal K. Interview: A conversation with Timothy McCall, MD. International Journal of Yoga Therapy 2009;19:143-7. 33. Kass JD, Friedman R, Lesserman J, Caudill M, Zuttermeister P, Benson H. An inventory of positive psychological attitudes with potential relevance to health outcomes: Validation and preliminary testing. Behav Med 1991;17:121-9. 34. Ryan RM, Frederick C. On energy, personality, and health: Subjective vitality as a dynamic reflection of well-being. J Pers 1997;65:529-65. 35. George LK. Still happy after all these years: Research frontiers on subjective well-being in later life. J Gerontol B Psychol Sci Soc Sci 2010;65B:331-9. 36. Charles ST, Carstensen LL. Social and emotional aging. Annu Rev Psychol 2010;61:383-409. 37. Stanley JT, Isaacowitz DM. Age-related differences in profiles of mood-change trajectories. Dev Psychol 2011;47:318-30. 38. Peterson C, Seligman MS. Character strengths and virtues: A handbook and classification. New York: Oxford University Press; 2004. 39. Bennett SM, Weintraub A, Khalsa SB. Initial evaluation of the LifeForce Yoga program as a therapeutic intervention for depression. International Journal of Yoga Therapy 2008;18:49-58. 40. Butler LD, Waelde LC, Hastings TA, Chen XH, Symons B, Marshall J, et al. Meditation with yoga, group therapy with hypnosis, and psychoeducation for long-term depressed mood: A randomized pilot trial. J Clin Psychol 2008;64:806-20. 41. Kjellgren A, Bood SA, Axelsson IK, Norlander T, Saatcioglu F. Wellness through a comprehensive Yogic breathing program - A controlled pilot trial. BMC Complement Altern Med 2007;7:43-50. 42. Krishnamurthy MN, Telles S. Assessing depression following two ancient Indian interventions: Effects of yoga and Ayurveda on older adults in a residential home. J Gerontol Nurs 2007;33:17-23. 43. Michalsen A, Grossman P, Acil A, Langhorst J, Ludtke R, Esch T, et al. Rapid stress reduction and anxiolysis among distressed women as a consequence of a three-month intensive yoga program. Med Sci Monit 2005;11:CR555-61. 44. Shapiro D, Cook IA, Davydov DM, Ottaviani C, Leuchter AF, Abrams M. Yoga as a complementary treatment of depression: Effect of traits and moods on treatment outcome. Evid Based Complement Alternat Med 2007;4:493-502. 45. Woolery A, Myers H, Sternlieb B, Zeltzer L. A yoga intervention for young adults with elevated symptoms of depression. Altern Ther Health Med 2004;10:60-3. 46. Heaney RP. Long-latency deficiency disease: Insights from calcium and vitamin D. Am J Clin Nutr 2003;78:912-9. 47. Seligman M. The effectiveness of psychotherapy: The consumer reports study. Am Psychol 1995;50:965-74. 48. Kristal AR, Littman AJ, Benitez D, White E. Yoga practice is associated with attenuated weight gain in healthy, middle-aged men and women. Altern Ther Health Med 2005;11:28-33. 49. Lazar SW, Kerr CE, Wasserman RH, Gray JR, Greve DN, Treadway MT, et al. Meditation experience is associated with increased cortical thickness. Neuroreport 2005;16:1893-7. 50. Concato J. Observational versus experimental studies: What's the evidence for a hierarchy? NeuroRx 2004;1:341-7. 51. Ligthelm RJ, Borzi V, Gumprecht J, Kawamori R, Wenying Y, Valensi P. Importance of observational studies in clinical practice. Clin Ther 2007;29:1284-92. 52. Forbes B. Yoga and managed care: A cautionary tale. International Journal of Yoga Therapy 2010;20:22-5. 53. Bufford RK, Paloutzian RF, Ellison CW. Norms for the Spiritual Well-Being Scale. J Psychol Theol 1991;19:56-70. 54. Iyengar BKS. Forward. In: Francina S, editor. The new yoga for people over 50: A comprehensive guide for midlife and older beginners. Deerfield Beach (FL): Health Communications; 1997. p. xiii-iv. Aging; vitality; well-being; women; yoga.